MARQUETTE — While Schools around Marquette County cancelled school today, Northern Michigan University did not. Despite the cold and snow many students still bundled up and battled the snow fall on their way to class. “I think it just means were better than everyone else here at NMU, were not intimidated by weather. Snow, we’ve seen it, we know it. We care about education more,”said Sam Miess, Northern Michigan University Student. But some students don’t feel the same way. “It’s kind of a disappointment, because weve had some really cold temperatures and a lot of snow; I feel like we should cancel as well,” Tyler Crisp, Northern Michigan University Student. While mother nature did not cooperate today, students still had to get to class. “Gotta learn chemistry that’s all I gotta say,” Steffi Suhon, Northern Michigan University Student. “My professor assigned a lot of homework today and we had homework due, so I had to come to class,” Crsip added. 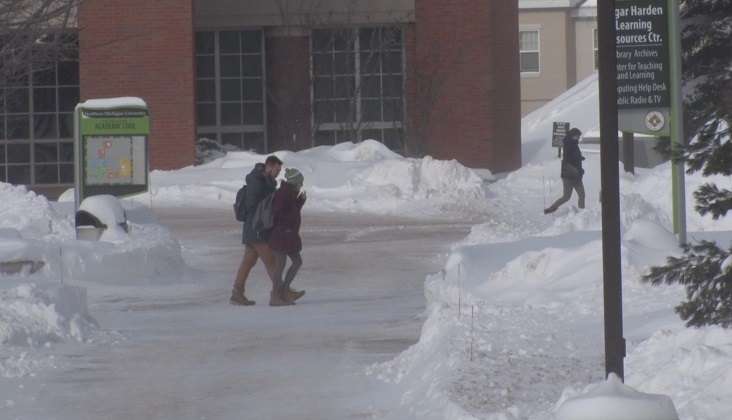 Some out of state students aren’t used to this much snow; students who have been attending NMU for some time have some tips for the newbies. “One of the things I struggle with is getting outside 15 minutes before I leave and warming up my car, that’s definitely a must. Also making sure you have hat and gloves in your car, just in case anything happens. It’s way too cold to be walking outside without them,” said Sadie Knill, Northern Michigan University Student. “I’m an avid snowshoer, so this is perfect weather for it,” added Miess. NMU students have a resilient spirit that you don’t see at every university. “It makes winter a whole lot better, especially coming from downstate. It’s just that U.P. charm; you get a certain type of excitement out of the winter time you don’t see anywhere else,” said Rob Klingler, Northern Michigan University Student. Northern Michigan University has already cancelled class a handful of times due to weather conditions.